The 1966 Worlds was a wild series sailed in very heavy air just about every day. I crewed for Britt Chance, and we were staying at the same guest house as the owner of Chaje 3. It sank during one of the races dragging Jussi Nemes son to the bottom until he got his foot freed from the rigging. Paul Elvstrom-- who had not competed in 5.5's before-- won the series easily. Alfred Edward 'Bill' Luders Jr. 31.12.1909-31.1.1999. During 1950 – 1981 he designed 72 5.5s. The first US 5.5 was drafted already 1950 but was never built. First boats to be built in 1956 were Pathfinder (Herman Whiton), Sabre (Ernie Fay) and Flame (Al Fay). The last design built (#1098) was Delta for Ernest Fay. At the Luders Marine Construction Co’s office many of the plans were made by Ted Brewer. He helped to draft and tweak over fifty 5.5 designs. Designs were numbered from the first to the last, 985-1098. After studies with Bob Wallstrom, a Luders historian, we find following Luders champions: Flame, Sabre, Complex III, Pride, Barranjoey, Fram III, Sundance, Chaje 3, Southern Cross IV, Arunga, Antares 2, Arunga III, Wildfire, Rhapsody and Papilio. 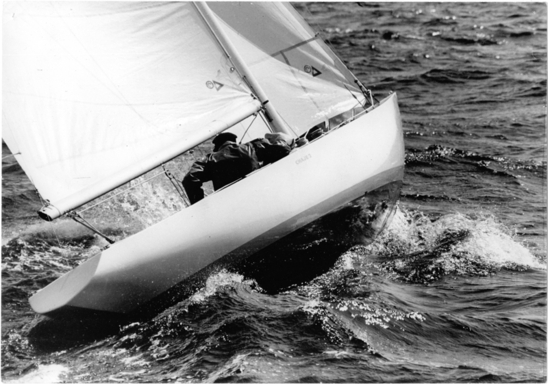 Luders' designed boats won the Gold Cup 14 times, the first 1957 and the last 1981. Vintage classic. Has sunk in Finland in 2005 but has been recovered and is on refit.